Reflection is a pleasant place never feeling crowded. Pools are small and chilly but that is normal. Dining staff at Blu is business like and distant unless asking for a good review. Aqua class gives easy access to way overpriced spa and silly heated tile covered couches. 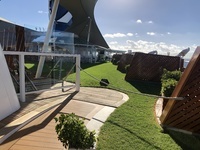 Aqua class offers little benefit over a standard balcony room. There are lots of small areas for socializing that probably account for the uncrowned feeling. The espresso service is staffed by untrained and ignorant people that seem inconvenienced when asked for an espresso drink that is not a latte or cappuccino. The ship functioned well as far as embarking and disembarking went. On and off quickly and without incident. We traveled with friends and had no problems dining together or finding time to be alone. 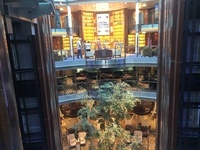 Again, the ship somehow manages to feel uncrowded even with more than 3000 passengers surrounding us. The shore excursions mostly went off without problems. 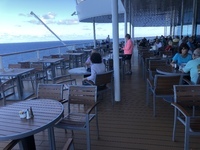 St Kitts had a steel band cruise that went to a different beach than advertised which was crowded, windy, messy, and had chairs and umbrellas for rent which was not mentioned in description. Also the boat was not able to stay accessible during visit. Caribbean beaches in my experience are very windy with difficult access though stony uneven walk through the beach break. In general a pretty ship that had a staff more interested in getting things their way than making me feel comfortable. 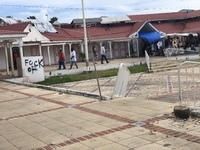 St Lucia flea market bus stop. Reflection is a pleasant place never feeling crowded. Pools are small and chilly but that is normal. Dining staff at Blu is business like and distant unless asking for a good review. Aqua class gives easy access to way overpriced spa and silly heated tile covered couches. Aqua class offers little benefit over a standard balcony room. There are lots of small areas for socializing that probably account for the uncrowned feeling. The espresso service is staffed by untrained and ignorant people that seem inconvenienced when asked for an espresso drink that is not a latte or cappuccino. 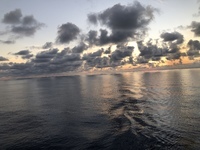 The ship functioned well as far as embarking and disembarking went. On and off quickly and without incident. We traveled with friends and had no problems dining together or finding time to be alone. Again, the ship somehow manages to feel uncrowded even with more than 3000 passengers surrounding us. The shore excursions mostly went off without problems. 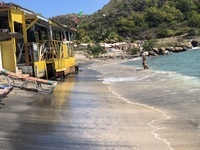 St Kitts had a steel band cruise that went to a different beach than advertised which was crowded, windy, messy, and had chairs and umbrellas for rent which was not mentioned in description. Also the boat was not able to stay accessible during visit. Caribbean beaches in my experience are very windy with difficult access though stony uneven walk through the beach break. In general a pretty ship that had a staff more interested in getting things their way than making me feel comfortable. Clean,quiet, unremarkable balcony room. Bathroom was larger than some I’ve been in. Lunch was fair. Beach was warm with a difficult wave break causing extremely difficult walk in and out of sea. Steel drum boat trip. Boat was noisy and bumpy ride. Beach was lousy. Different than the one planned. Too windy for paid for umbrellas that were not part of the advertised trip. Glass bottom boat advertised was a joke. Some pains of dirty glass visible though wells on the boat. In general a waste. Great guide on bus. Shopping stop was grubby stalls in a decaying outdoor market. The boat ride was pleasant around the lagoon.